When emotional intelligence first appeared to the masses, it served as the missing link in a peculiar finding: people with average IQs outperform those with the highest IQs 70 percent of the time. This anomaly threw a massive wrench into what many people had always assumed was the sole source of success -- IQ. Decades of research now point to emotional intelligence as the critical factor that sets star performers apart from the rest of the pack. 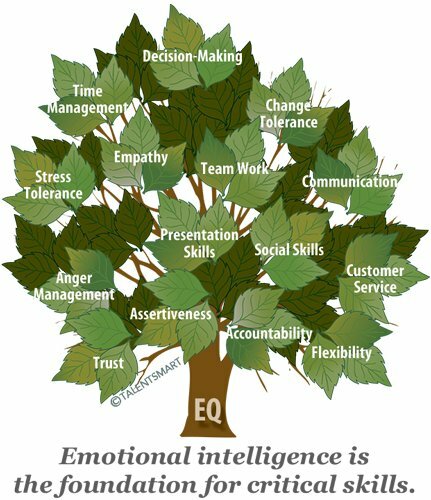 Emotional Intelligence is the "something" in each of us that is a bit intangible. It affects how we manage behavior, navigate social complexities, and make personal decisions that achieve positive results. Emotional intelligence is made up of four core skills that pair up under two primary competencies: personal competence and social competence. Social competence is made up of your social awareness and relationship management skills; social competence is your ability to understand other people's moods, behavior, and motives in order to respond effectively and improve the quality of your relationships. Relationship Management is your ability to use awareness of your emotions and the others' emotions to manage interactions successfully. Emotional intelligence taps into a fundamental element of human behavior that is distinct from your intellect. 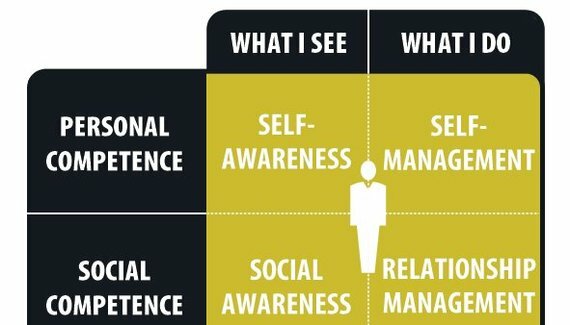 There is no known connection between IQ and emotional intelligence; you simply can't predict emotional intelligence based on how smart someone is. Intelligence is your ability to learn, and it's the same at age 15 as it is at age 50. Emotional intelligence, on the other hand, is a flexible set of skills that can be acquired and improved with practice. Although some people are naturally more emotionally intelligent than others, you can develop high emotional intelligence even if you aren't born with it. Personality is the final piece of the puzzle. It's the stable "style" that defines each of us. Personality is the result of hard-wired preferences, such as the inclination toward introversion or extroversion. 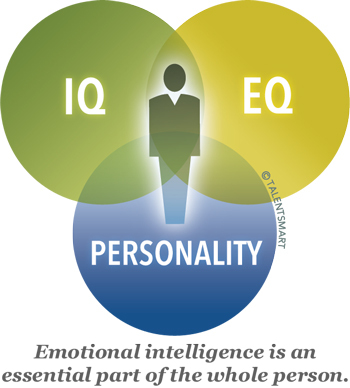 However, like IQ, personality can't be used to predict emotional intelligence. Also like IQ, personality is stable over a lifetime and doesn't change. IQ, emotional intelligence, and personality each cover unique ground and help to explain what makes a person tick. How much of an impact does emotional intelligence have on your professional success? The short answer is: a lot! It's a powerful way to focus your energy in one direction with a tremendous result. TalentSmart tested emotional intelligence alongside 33 other important workplace skills, and found that emotional intelligence is the strongest predictor of performance, explaining a full 58% of success in all types of jobs. Your emotional intelligence is the foundation for a host of critical skills--it impacts most everything you do and say each day. Of all the people we've studied at work, we've found that 90% of top performers are also high in emotional intelligence. On the flip side, just 20% of bottom performers are high in emotional intelligence. You can be a top performer without emotional intelligence, but the chances are slim. Naturally, people with a high degree of emotional intelligence make more money--an average of $29,000 more per year than people with a low degree of emotional intelligence. The link between emotional intelligence and earnings is so direct that every point increase in emotional intelligence adds $1,300 to an annual salary. These findings hold true for people in all industries, at all levels, in every region of the world. We haven't yet been able to find a job in which performance and pay aren't tied closely to emotional intelligence. The communication between your emotional and rational "brains" is the physical source of emotional intelligence. The pathway for emotional intelligence starts in the brain, at the spinal cord. Your primary senses enter here and must travel to the front of your brain before you can think rationally about your experience. However, first they travel through the limbic system, the place where emotions are generated. So, we have an emotional reaction to events before our rational mind is able to engage. 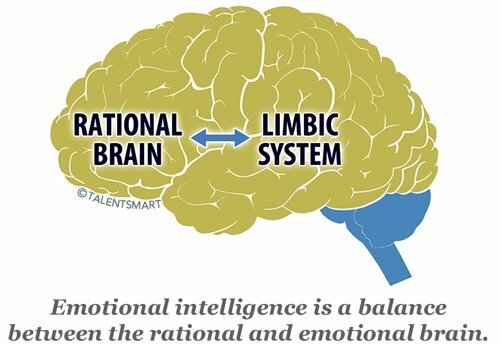 Emotional intelligence requires effective communication between the rational and emotional centers of the brain. Plasticity is the term neurologists use to describe the brain's ability to change. As you discover and practice new emotional intelligence skills, the billions of microscopic neurons lining the road between the rational and emotional centers of your brain branch off small "arms" (much like a tree) to reach out to the other cells. A single cell can grow 15,000 connections with its neighbors. This chain reaction of growth ensures it's easier to kick a new behavior into action in the future. As you train your brain by repeatedly practicing new emotionally intelligent behaviors, your brain builds the pathways needed to make them into habits. Before long, you begin responding to your surroundings with emotional intelligence without even having to think about it. And just as your brain reinforces the use of new behaviors, the connections supporting old, destructive behaviors will die off as you learn to limit your use of them.